From November 2016 to February 2017, BP customers could engage with Miles at the pump to listen to music on Pandora, create an e-card to share on social media, play music, trivia games, and check the news and weather. Is there a way to make pumping gas fun? 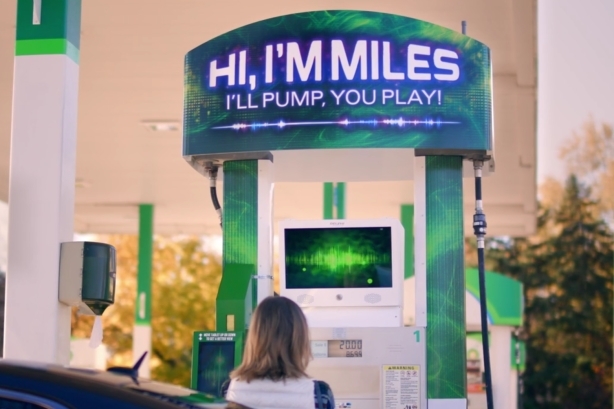 BP recently explored this idea with the creation of Miles, a gas pump with a personality who actually interacted with customers as they fuelled their cars. BP began planning for the campaign in May 2016 with the help of its branding AOR, Ogilvy. Goals were to develop a campaign that increased consumer social engagement online and through traditional media, and reinforce the message that the BP is innovative among a millennial target audience. The brand recognized that fueling can be a mundane chore and that gas is a commoditized, low-consideration category. The campaign wanted to give millennials a reason to purchase BP gas by offering a way to make those few minutes at the pump a little more fun. Thus, the idea for Miles Personality Pump was born. Ogilvy worked with Next/Now, a technology company, and Vibes, an SMS technology vendor, to develop an interactive experience at the pump. Miles used recognition software to sense when new users approached the fuel dispenser and greeted them to initiate the experience. Mindshare assisted with media support efforts and Digitas, BP's digital AOR, helped out with digital assets that went along with the development of the interactive technology. In addition, the campaign team developed a partnership with Pandora to incorporate pump-side music streaming services into Miles. "We also worked with the A.V. Club, The Onion’s music and entertainment arm, to create Miles’ music trivia challenge and lend its music credibility to Miles’ unique personality," explained Donna Sanker, CMO of BP Fuels North America. BP and The Onion’s social channels were used to drive awareness of the campaign, and a targeted media outreach strategy was executed. "Since this was very much a consumer-focused campaign, we were targeting a broad range of media for the launch, including news, consumer tech, lifestyle publications, as well as trade publications for the auto and fueling sectors," said Sanker. BP and The Onion unveiled Miles to the world on social channels and on The Onion website using a series of three long-form videos and sponsored articles. The video series features a humorous love story between a young woman and Miles. BP Laura and Miles from Spencer Lantz on Vimeo. Leading up to the mid-November release of Miles, the campaign team held embargoed media sessions in New York City and Chicago, allowing journalists to try out the experience for themselves. Select media received exclusive previews with briefings to provide more in-depth information and pre-launch access to interviews with BP spokespeople. On November 15, 2016, the new Miles interface launched at four BP fuel stations in Chicago; Naperville, Illinois; and Brooklyn, New York. "While filling up, consumers could select their favorite genre of music on Pandora, record a video e-card to share on social media, take a picture with amusing overlays and frames, or play music trivia," said Sanker. "Miles could process responses in real-time through a touch screen tablet and talk consumers through a wide array of entertainment options." Customers who experienced Miles could also sign up via text message to get 25 cents off per gallon of gas on a future visit to BP. In late November, the campaign team collaborated with Good Morning America to produce a segment showcasing Miles. The show's meteorologist, Rob Marciano, tried out Miles and its functionality firsthand. The PR team continued to pitch national news media, circulating an audio release and several video clips to drive coverage as the campaign went on. The Miles pumps ran through Valentine’s Day 2017. During the course of the campaign, Miles made 2,500 new friends, and visitors spent more than 5,200 minutes interacting with the pumps. In the first eight weeks following the launch, the campaign generated a total of 833 million media impressions, measured across social and traditional outlets. This exceeded initial impression targets by 122%. The Good Morning America segment was also posted to ABC's website after it aired, contributing 22 million media impressions. Coverage of Miles appeared in top tech and lifestyle outlets, including: Yahoo Tech, The Verge, ABC, the New York Post, the Chicago Tribune, and BGR. The audio release was syndicated to 743 radio stations and appeared on more than 1,000 broadcasts in top markets, such as New York, Los Angeles, and Chicago.